Edward’ s practice primarily involves complex personal injury cases for clients who have suffered serious personal injuries as a result negligent conduct, including medical negligence, product defects, workplace accidents, automobile accidents and unsafe premises. Edward’s practice also includes legal malpractice cases and complex commercial litigation, including class actions and qui tam matters. Edward graduated from New School University in 2003. 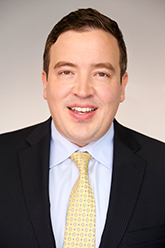 He obtained his Law Degree from the University of Pennsylvania in 2010, where he was an Assistant Editor on the Business Law Journal and received a ‘Pro Bono Volunteer of the Year’ award. After graduating law school, Edward clerked for the Honorable A. Richard Caputo in the District Court for the Middle District of Pennsylvania. Litigation of complex civil cases involving serious personal injury, medical malpractice, product defects, workplace accidents, automobile accidents, unsafe premises, commercial disputes and legal malpractice.